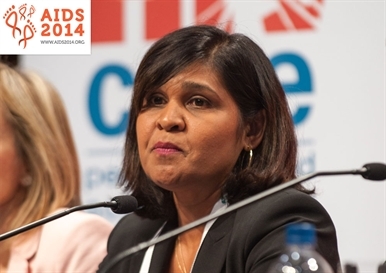 Dr Deborah Persaud, principal researcher in the Mississippi baby case, speaking at AIDS 2014. Photo: International AIDS Society/Steve Forrest. The 20th International AIDS Conference (AIDS 2014) heard yesterday that the reappearance of HIV in a girl now aged four, who maintained an undetectable viral load off therapy for more than two years, shows that HIV infection may become established in a handful of the long-lived central memory immune cells much sooner after initial exposure to the virus than previously thought, and that HIV may reappear without warning in people with absolutely no indicators of infection. A study in monkeys has also recently found that the virus becomes integrated into the genes of central memory cells sooner than previously thought, and even prior to the appearance of HIV in the blood. These studies have implications for cure research and for post-exposure prophylaxis (PEP) because they imply that lifelong infection may in some cases become established within hours. In the case of the 'Mississippi baby', a young girl was started on HIV therapy (zidovudine, lamivudine and nevirapine) within hours of birth. The nevirapine was switched shortly afterwards to boosted lopinavir and her viral load had dropped to below 50 copies/ml within a month and below 20 copies/ml within four months. When 18 months old, owing partly to her mother’s health access difficulties, she dropped out of care and stopped taking treatment and when her mother re-presented for care 11 months later, the little girl still had a viral load below 20 copies/ml. The case attracted a lot of attention as a possible cure and researchers conducted a number of tests to find out if there was any trace of viral infection. Amongst other indicators, the girl lost her antibody response to HIV or any component of it and became HIV-negative. It was possible to find integrated HIV DNA within circulating lymphocytes (white blood cells) but at the exceedingly low level of less than 2.6 copies per million cells; it was not possible to recover replication-competent virus from cultivated and stimulated T-cells; and the girl’s CD4 and CD8 cells lacked any cellular immune response to HIV. It was therefore disappointing when, at the age of three years, nine months and 24 days, a viral load test showed that HIV had suddenly reappeared and that the young girl had a viral load of 16,750 copies/ml, which was confirmed by a second test shortly afterwards. At this point, she had antibodies to two specific HIV viral proteins – the envelope protein gp160 and to the ‘early warning’ core protein p24 which can often be detected in advance of antibodies to HIV and is therefore included in fourth-generation HIV tests. Within a week, the girl had an antibody response to most components of HIV, meaning she was again ‘HIV positive’ as defined by the standard Western blot assay. Phylogenetic testing showed that the HIV that had reappeared was identical to the HIV that had disappeared some 27 months earlier, and was 98% similar to her mother’s HIV. This removed any lingering doubt that the girl might not actually have been infected in the first place but might simply have been passively carrying virus from her mother after being born. Its lack of genetic evolution from the previous sample also showed that it had not been replicating at a very low level in the girl’s memory cells, but had probably been carried as a single piece of HIV DNA within a handful of memory cells, or even one cell, until some kind of immune stimulant such as another infection caused the cellular differentiation and the reappearance of an active infection. A study in Nature recently reported that HIV reappeared in monkeys that were infected with HIV and were given antiretroviral therapy within three days of infection – so soon that they had not actually developed a detectable viral load in their blood. Dr Deborah Persaud, principal researcher in the Mississippi baby case, commented that despite the reappearance of the virus, “prolonged viral remission for 27 months without treatment was achieved for this child”, and that the study was also a clinching proof of the hypothesis that HIV infections are re-seeded from viral DNA carried in quiescent cells. The challenge now was to understand the unpredictable nature of viral rebound. Meanwhile, the little girl herself is back on treatment and her viral load heading back down towards undetectability. Persaud D The path towards HIV-1 cure: lessons from the “Mississippi Child”. 20th International AIDS Conference, Melbourne. Symposium presentation MOSY0501, 2014. Whitney James B et al. Rapid seeding of the viral reservoir prior to SIV viraemia in rhesus monkeys. Nature, early online publication. Doi:10/1038/nature 13594. 2014.